Our Big Blue Door True Stories Jam is this Thursday, Sept 20, at 8 pm at Sweet Haus. 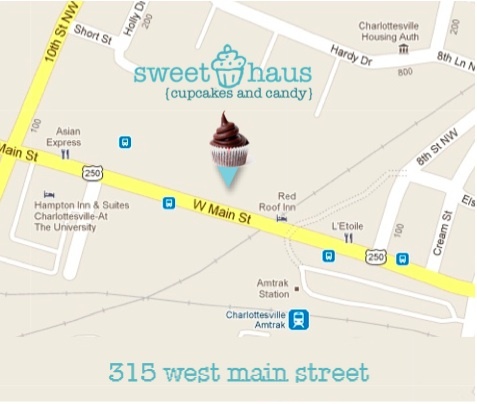 It’s the same Sweet Haus that has been making delicious cupcakes next to Random Row Books on the Lewis-and-Clark-statue-end of Main Street, but now they’ve moved to a beautiful new larger store closer to the UVA end of Main Street. It’s just over the Amtrak railroad bridge. Check out the map above spruced up from Google.